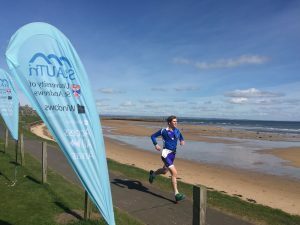 The St Andrews Spring Sprint was a last minute addition to my race calendar, entering only on the Tuesday before a Sunday race. But I realised it would serve an important purpose in trying a few things out before my first standard distance race in few weeks, and give me a good excuse to explore St Andrews for the first time. One of the things I wanted to test was my new trisuit. Boy, was I glad I did! It turns out that my fabulous new Edinburgh Triathletes trisuit chafes on the bike in some rather NSFW places… So my next plan before I try to cycle twice the distance in it, will be to try some Bodyglide “down there”, and see if that makes a difference. I’ll try to find some time for another 20km+ cycle in the trisuit and with bodyglide. The second thing I wanted to test was my bike. After >1 year in hibernation, I’ve finally got around to re-assembling the TT bike. I was worried that it might not have been quite the course for a TT bike, as the elevation profile looked rather lumpy. In the event, it was probably perfect as I managed to stay down on the aerobars for the whole time. Finally, I also tried out socks and toewarmer overshoes. The socks were to address an issue with my right big toe getting a blister. I’m not sure why this has suddenly developed with these 9-month old shoes, but hey. The toewarmers just seemed like a good idea as they are much quicker to put on than overshoes, and I didn’t fancy have cold toes like at Tranent. Anyway, with that rather lengthy introduction to my various changes, onto the race itself. The swim went well. I managed to take a few seconds off my time at Tranent a few weeks earlier. I started second in my lane and felt that the swimmer in front was holding me up, so I overtook after a few lengths. In the long run, this might not have been smart, as he finished right on my toes and was getting all the drafting benefit. I should learn to swim (and run) up close to other racers, rather than always craving my own space. It did mean I came 2nd out of the water in my heat though! A long transition whilst I battled trying to put on a jacket and my socks. I think the socks worked – no blisters! – but they do take up a lot of time. It was frustrating seeing many people that I’d beaten in the water come flying past in transition. The course was a little long, which caught me a little bit by surprise, but does at least account for the longer than usual time. After a slow transition, I felt a little bit sluggish for the first few km of the bike. In fairness, it was also up a hill! Eventually, I settled into a nice rhythm. I think there were 2 more cyclists from my heat up the road, but I couldn’t see them or anyone behind me, so it became a real time-trial. This was where I noticed that my new club trisuit was actually chafing in the saddle area. I managed to avoid focussing too much on this though and carried on with my race. T2 passed largely without comment. Looking at the results, it’s clear that many people were in the 30-40s range, so I could easily shave some time off there with practice. I’ve never been in any danger of running a sub-20min 5k, so as I was approaching the finish line, I knew this run was seriously short. This run is also incredibly hilly. After running out of transition with jelly legs, the first thing you do is run up a cliff into a caravan park, and continue running uphill through the caravan park. It is a brutal first kilometre! 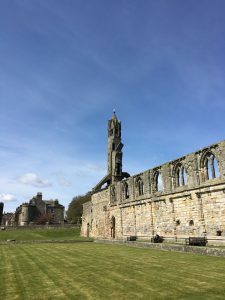 After that, it is back downhill and then hugging the coastline for a rather picturesque run through St Andrews, including running around the outside of the St Andrews Cathedral ruins. A good race for me, no major screw-ups and everything went well. It is a shame the distances are so far off – makes it even less comparable than usual between events. I’m glad to have found out where my trisuit chafes before I attempt double the distance in a few weeks time. 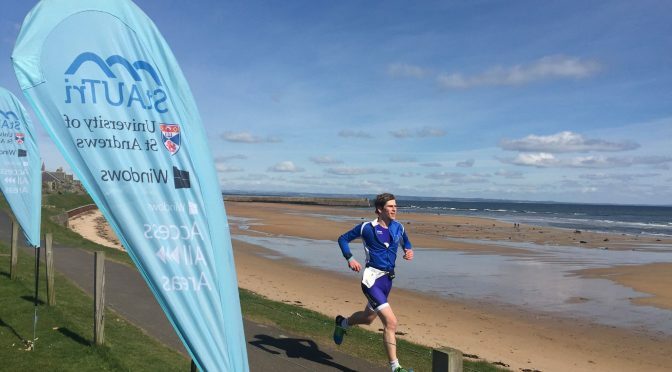 Bonus: St Andrews is really nice setting for a race, as the town is beautiful and there is a lot to do post-race. We set about exploring the ruins of the Cathedral, heading to the University museum and walking around the beaches.